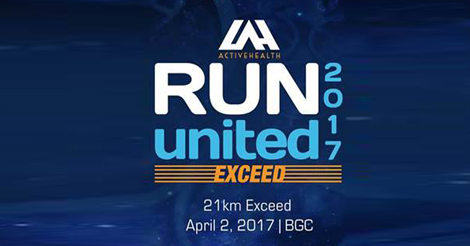 Home / Active Health / Race / Run United / Run United 2017 / Run United 2017 21Km Exceed / Run United 2017 Calendar / Running Event Details / Runrio / Unilab / Run United 2017: Trilogy No More! The much anticipated trilogy in the running community is not anymore a trilogy! Change is really on-going! And yes, even the running community is greatly affected by various changes. And one of these is the Run United. Active Health just recently announced that this year, Run United is not anymore a trilogy. It's now a stand alone race with a 21K specific distance. Hence it's dubbed as the Run United 2017 Exceed 21K. The race will be on April 2, 2017 at the Bonifacio Global City (BGC), Taguig. We will be sharing more details about this race such as the medal, singlet, and finisher shirt designs very soon! Runners say that Run United was revert back to its original 2010 format wherein the race was stand alone. And before that all the trilogy was sponsored solely by Unilab or Active Health, each leg was sponsored by different brands.